February, the trash heap of the calendar, is half over, prompting us to once again start wondering: Why is it so effed up? What’s with the short month? The (equally) short answer — the Romans. The show It’s Okay to be Smart on PBS has a quick video (with pictures!) to explain the situation. It starts with the first King of Rome, Romulus, who had a problem organizing all the drunken parties, ceremonies and celebrations. He needed a system to keep track of his social comings and goings and he needed it fast. Nobody wants to miss a good party. According to IOTBS, ancient astronomers already had accurate calculations for the time between the two solar equinoxes (solstices), and then there were those “natural” calendars in the sky that tracked time, also known as planets. The lunar calendar Romans used had 10 months of either 30 or 31 days, beginning in March and ending in December. The months we know today as January and February did not exist. Obviously, trying to keep track of time between December and March was a huge issue, so the second King of Rome, Numa Pompilius, tried implementing a solution. Fun fact: even numbers were considered bad luck in ancient Rome — which, you know, makes calendar crafting a bit dicey — so Numa started removing a day from all the even numbered months. Also, he wanted to created a calendar of 12 lunar cycles, which equals 354 days (a dreaded even number), so he rounded his calendar up to 355. The remaining days were split into two months, January and February. The end. Just kidding! Now, you might be thinking, “But 28 is an even number!” and you’d be correct. But back in the day, February was dedicated to “spiritual purification” so it was cool. Even weirder and way more confusing is that February was initially split up into two parts, with the first part being the first 23 days. However, this stupid calendar would always be out of whack with the seasons by about 10 days, so every other year, Numa added a 27 day “leap month” after February 23 in order to sync up with the season. This way, every four years would average out to 366.25 days, which even if you’re not good at math, you know is too many days. The problem with this plan is that those leap months weren’t always added for whatever reason (war, tiredness, trying to stay alive, political favors, etc.) and by the time Julius Caesar took power, he couldn’t take it anymore and made a big change. A big fan of Egypt’s 365-day calendar, he ditched the lunar calendar in favor of a solar option, and in 46 B.C. a more “normal” calendar began to take shape. Caesar added 10 days to various months to reach 365 days. 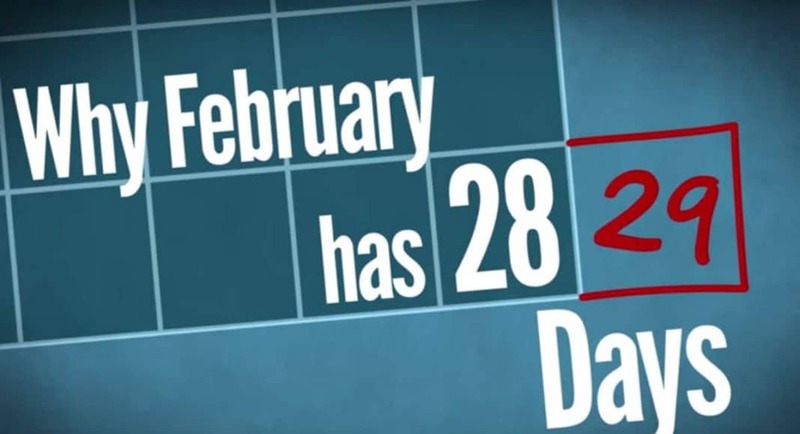 And, according to IOTBS, since a tropical year is 365.24 days, he added a leap day every four years, confusing people all over the world forever and ever. Hey, at least Valentine’s Day is mid-month, so we have a candy holiday to look forward to. Sugar makes up for a lot of shortcomings.